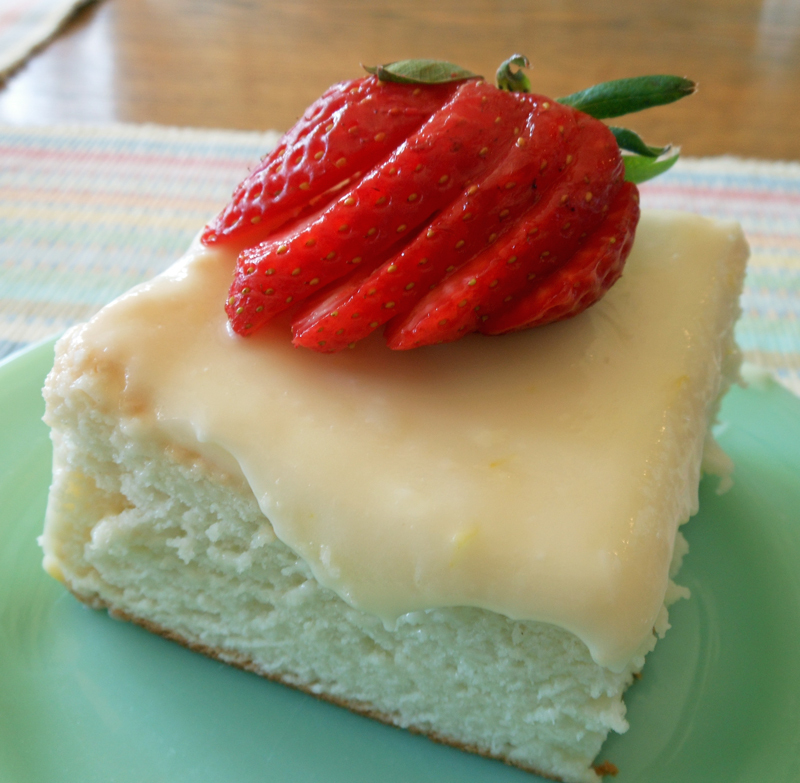 This is a classic angel food cake that I made for Easter. I made it in a 9″ x 13″ baking pan, but you may also bake it in an ungreased angel food cake pan or in 3 ungreased (9-inch) round pans. The cake and frosting are delicous, but my husband and I thought the frosting was too sweet. My daughter loved it. I think, though, it would be good for a drizzle over a hot cake. This makes quite a large cake. Bigger than an angel food cake mix. I beat my egg whites in my mixer and they came right to the top of my pan. Then I transferred them to a bigger bowl to fold in the sugar mixture. This was such a good angel food cake mix, I am anxious to try it some different ways. Preheat oven to 375 degrees. Line bottom and sides of a 13″ x 9″ pan with aluminum foil, allowing 2 to 3 inches to extend over sides of pan. (Do not grease pan or foil.) Sift together first 3 ingredients. Bake at 375 degrees on an oven rack one-third up from bottom of oven 30 to 35 minutes or until a wooden pick inserted in center of cake comes out clean. Invert cake onto a lightly greased wire rack; let cool, with pan over cake, 1 hour or until completely cool. Remove pan; peel foil off cake. Transfer cake to a serving platter. Spread Lemon-Cream Cheese Frosting evenly over top of cake. Garnish, if desired. Times for angel food cake pan is also 30 to 35 minutes, and 9-inch round pans is 15 to a18 minutes. Beat cream cheese and butter at medium speed with an electric mixer until creamy; add lemon juice, beating just until blended. Gradually add powdered sugar, beating a low speed until blended; stir in lemon zest.